Roaring Lion and Saxon Warrior were meeting for the sixth time and the 10-furlong Group One produced a similar result to the Coral-Eclipse at Sandown back in July, as the pair went head to head in the final furlong before Roaring Lion got the upper hand on the line. 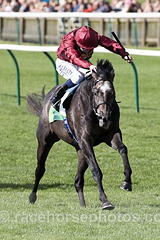 Roaring Lion was sent off the 8-11 favourite for John Gosden and Oisin Murphy, and the rider was content to sit at the back of the field with only Study Of Man behind him through the larger part of the race. In contrast, Ryan Moore took up a forward position on Saxon Warrior, as fellow Aidan O’Brien inmate Deauville set the pace, and it was Saxon Warrior who set sail for home with over a furlong to run. However, Murphy was stoking up Roaring Lion after finding himself coming wide on the bend and he produced another electric turn of foot to pull level with Saxon Warrior a handful of strides before the finish. The success takes the score to four wins to Roaring Lion, with 2000 Guineas hero Saxon Warrior having come out on top twice. Murphy said of the neck winner: “The race changed complexion about three times. Saxon Warrior got a great ride from Ryan and he got first run. “It was very tactical and John and I thought it might turn out that way. I just wanted to get into a nice rhythm, get him balanced and then see which was the better horse. I had to get him into top gear and he’s come home really well. “I don’t have much experience around Leopardstown and I’m learning on the job, but I had the right horse. Gosden’s son, Thady, added: “He had to do it the hard way and come around the field, but he’s got the job done. “He and Oisin have gelled incredibly well and it’s been an incredible day for Oisin as he only rode his first winner in Ireland earlier in the day (aboard Limini). “In terms of where he goes next, we will have to talk to the owners and also see what the ground is like at Ascot for the Champion Stakes. He’s shown today how important good ground is for that turn of foot that he’s got. Winning owner Sheikh Fahad al Thani of Qatar Racing said: “It’s very special to win our own race, and the race didn’t disappoint in terms of quality. They are two great three-year-olds who have been taking each other on since last year. “He’s trained by a master trainer in John Gosden and has been brought up slowly. Even the Derby was an education for him. O’Brien was satisfied with Saxon Warrior’s effort and confirmed the Queen Elizabeth II Stakes on Champions Day remains the plan for the 2000 Guineas winner.